Risington’s OMG quotient is so high that it’s garnering a tremendous response – and rightfully so! At the best price you’ll find on Central OMR, perfectly located (at thriving Karapakkam), 50+ amenities, vast open spaces, a 790 acre forest as a backdrop, and the choicest 1,2 & 3 BHK homes you’ll find – no wonder scores of families have chosen Risington! We’re so happy and excited to see how many people are interested in a project that we have sunk countless hours and resources into, as well as everything decades of experience and happy customers have taught us. For those who have already booked, we have some great news! Your investment has appreciated by Rs.100/- per sq.ft. 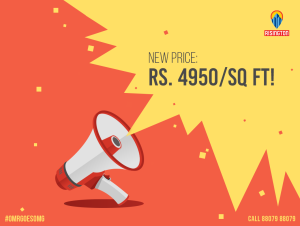 Risington prices have been revised from Rs.4850/-* per sft to Rs.4950/-* per sq.ft. For those who are still on the fence or in the middle of your decision-making process, better decide fast – even at Rs.4950/-* per sq.ft. Risington offers the BEST DEAL on Central OMR! This price will also be available for limited bookings only – so book your home as soon as you can! Many others already have. Prices will go up again soon! What's so smart about a Smart City?